Conceptually, it's a hybrid. Tung oil purists scoff at the amount of solvent in it. like the pour and spread workability of a poly or varnish, but don't want the plastic look. This manufacturer makes satin and high gloss. As you can see, satin is NOT flat. Tung oil, which is from the nut of the Chinawood Tree, is way too thick to penetrate wood without being thinned. But when it is thinned, usually with mineral spirits and/or naphtha, it replenishes and rejuvenates dry wood. Like polyurethanes, this finish is applied as a coating, poured and pulled evenly, one coat at a time. 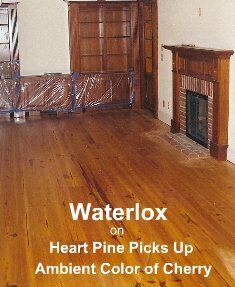 The first two coats usually penetrate, the next one or two start to achieve a protective wear layer and sheen over the wood. 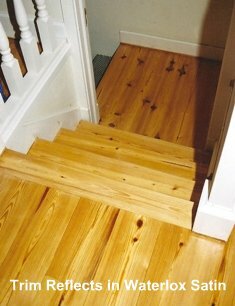 but do keep in mind that the natural color of tung oil nicely picks up, what I call, the ambient colors of any room. ...you have to thin it with solvents. Generally, nasty! This manufacturer's original recipes were always known for strong odor and slow cure, but good for long life-cycles. even though OSHA is satisfied in those jurisdictions. for the transport of small quantities, as far as I know. Here in the Twin Cities, I might still be able to scrounge a few gallon cans of the original formula if you need some. Just let me know. The last note on VOC is that, according to the manufacturer, the original formula can go over the newer formulas, but do not put the newer formulas over the old.